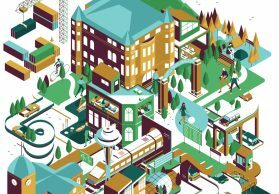 Making a city work well for everyone involves lots of moving parts — from researching effective legislation to fighting for fair housing to literally keeping the lights on. Take Seattle, for instance: Each day nearly 12,000 people work behind the scenes to keep the city running, according to the city’s website. Members of the Seattle Pacific University community are in this mix, tackling the big questions and providing effective answers. One problem-solver is Traci Ratzliff ’88. As a legislative analyst for the Seattle City Council, Ratzliff works behind the scenes to shape city policy and advise lawmakers on how initiatives, programs, and funding might affect the community. Ratzliff has conducted background research for city policies on housing, economic development, and parks. Recently, she worked on the Multifamily Tax Exemption Program, which provides a tax exemption to builders in exchange for setting aside a percentage of units in multifamily buildings as income-restricted housing. She helps council members play the delicate game of balancing budgets while providing policies that will improve Seattle residents’ quality of life. It’s hard to master, even after 20 years on the job. Nearly three quarters of a million people live within the Seattle city limits, and 3.8 million people call the Seattle metro area home, according to 2016 U.S. census data. Seattle has one of the largest populations of people experiencing homelessness in the U.S., trailing only Los Angeles County and New York City, according to data published in December 2017 by the U.S. Department of Housing and Urban Development. The census of people experiencing homelessness is conducted annually across the U.S. 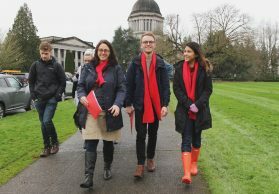 In King County, 1,000 volunteers gathered on January 26, 2018, and canvassed the county between 2 and 6 a.m. to count the number of people living on the street or in cars. Of course, as a city gets bigger, so do its problems, and Associate Professor of Sociology Karen Snedker is tackling two of them with research on problem-solving courts and homelessness. Snedker’s recent research examines courts designed to treat people with mental illness who are accused of crimes. Treatment courts designed to assist specific communities, such as veterans, or problems, such as drug abuse, are relatively new in the U.S. justice system. These special courts aim to solve problems, rather than punish inappropriate behavior. Snedker and Associate Professor of Sociology David Diekema will teach classes on courts and other issues related to crime as part of SPU’s new bachelor of arts in criminal justice, open to students this autumn. 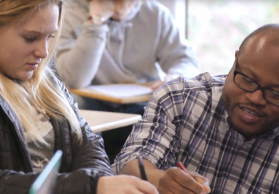 The major prepares students for work in justice by giving them a broad background of knowledge on the infrastructure and systems that encourage and prevent crime and injustice. Housing is another challenge of urban spaces, and it is closely linked with crime. While estimates from the U.S. Department of Housing and Urban Development suggest that less than 1 percent of the country’s population is homeless at any given time, as many as 1 in 10 people in the U.S. might be homeless at some point during their life. The rates are higher among the incarcerated. Fifteen percent of the 11 million people put in jail every year report having been homeless, according to the U.S. Interagency Council on Homelessness. And around 48,000 people enter shelters every year straight from prison or jail. The homeless community in King County stands at 11,643, according to the 2017 one-night census of people who are homeless. Snedker teaches classes on homelessness, crime, and other urban problems, and encourages students to use their academic knowledge as a tool to fight the injustice they see. It’s important to bridge the gap between people without homes and people with homes, Snedker says. 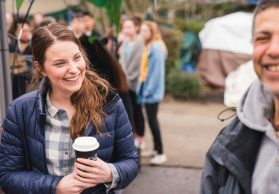 Seattle Pacific students had the opportunity to do that this past winter, when Tent City 3 moved on campus for the third time. The rotating, self-managed, city-sanctioned community is one of 11 in the Seattle area. Hosting the community lets students and others see homelessness firsthand and learn how to advocate for those who are homeless, says Snedker. Because of the hands-on experience with TC3, Seattle Pacific has a particularly powerful voice to contribute to advocacy efforts around housing, says Niki Amarantides, director of SPU’s Center for Learning and co-chair, with Snedker, of SPU’s Committee on Homelessness. Amarantides, along with other members of the Seattle/King County Coalition on Homelessness, advocates for more affordable housing in Seattle. In 2015, the coalition worked with the Seattle City Council to increase funding for homelessness spending, including emergency shelters, safe parking, meal programs, and eviction-prevention programs. In January, the coalition hosted a homelessness advocacy workshop on the SPU campus for faculty, staff, and students. The group also works to help people living on the streets move into shelters. As federal funding around housing assistance faces cuts, Amarantides is rallying local problem-solvers to address the housing crisis. Problem-solving courts collaborate with service and treatment providers to address underlying social problems that cause individuals to appear repeatedly in court. Seattle Municipal Court provides specialized courts to address offenses involving domestic violence, veterans, youth charged with traffic violations, and mental illness. Research shows that these courts convey a higher sense of respect, neutrality, and trustworthiness than traditional courts. People in problem-solving courts are also more satisfied with the outcomes than those involved with traditional court proceedings. While Snedker and Amarantides advocate for justice in Seattle’s courts and housing, Drew Grissom ’10, an energy trader for Seattle City Light, makes sure the lights and power stay on. Only small quantities of energy can be stored for later use, so most of what Seattle City Light produces must be used immediately, by Seattle or another city. Grissom’s team buys and sells energy from other power producers in the Northwest to keep it flowing and to keep prices low. Grissom and his fellow traders track market prices for energy, instructing operators to open dams on the Skagit or Pend Oreille rivers and generate electricity when they can sell the extra for high prices. When power is cheap, they keep the dam generators off and purchase energy from elsewhere. For instance, on one extra windy day in the last week of March, wind farms in Eastern Washington generated a lot of electricity. Energy prices plummeted, so Grissom bought wind electricity and told operators to keep the generators off, saving the water to generate electricity another day. To do this, he trades with other cities and municipalities for profit. He monitors energy usage hourly to make sure that Seattle has the power it needs, doesn’t experience an energy shortage, and uses the cheapest energy possible. The job is unpredictable, and Grissom loves it. He moved to Seattle City Light from a job in finance at Boeing. The best traders are talkative, personable, and love making deals, he says, but are also willing to wait while nothing happens. Grissom often works in the background, out of the leadership spotlight. But he, Ratzliff, Snedker, and Amarantides are working hard to create a society that works effectively for everyone, not just a select few. While the price of housing and other Seattle living costs creep upward, one expense stays low. The price of electricity in March was $0.111 per kilowatt-hour, under the national average of $0.135 and far behind other big cities like New York ($0.198) and San Francisco ($0.212). That’s due partly to the work of energy traders like Drew Grissom ’10, and also to Seattle’s watery surroundings. Thanks to dams on the many rivers in the area, Seattle can produce more energy than it needs, which keeps prices low, Grissom says.